Today in Masonic History Gotthold Ephraim Lessing is born in 1729. 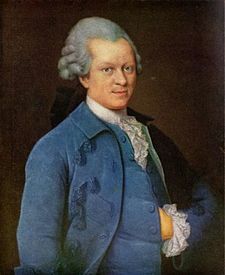 Gotthold Ephraim Lessing was a German writer and philosopher. Lessing was born on January 22nd, 1729 in Kamenz, a small town in Saxony. From 1737 until 1741 he studied in the Latin School in Kamenz. Next he attended Fürstenschule St. Afra a school in Meissen, Germany for gifted students. Lessing's father attended the school and his father wanted him to follow in his footsteps. After Fürstenschule St. Afra, Lessing attended University of Leipzig where he pursued a degree in theology, medicine, philosophy, and philology. While at the University Lessing met and established a relationship with Karoline Neuber, a famous German actress. Lessing translated several plays for her from French into German. It was also during this same time that he wrote his first play The Young Scholar. Later Neuber would produce the play for him. Over the next twelve years, Lessing lived in Leipzig and Berlin. He worked for Vossische Zeitung, a liberal paper at the time, and other periodicals. In 1750 in Berlin, with his cousin, Christlob Mylius, they started Beitrage zur Historie und Aufnahme des Theatres. The paper only ran for four issues, it did manage to put Lessing out as a serious critic and theorist of drama. In 1752 he attended Martin Luther University of Halle-Wittenberg where he took his masters degree. From 1760 to 1765, Lessing was secretary to General Tauentzien during the Seven Years' War. During that period he wrote his book Laokoon, or the Limitations of Poetry. In 1767 Lessing went to work for the Hamburg National Theatre. There he was tasked with being the in house critic of plays and acting, a position that would be later known as dramaturgy. Essentially a dramaturge, Lessing was the first, is responsible for researching plays for accuracy and making sure that writing and acting in a play is up to par. Lessing also had a friendship with Moses Mendelssohn, the Jewish-German philosopher. Mendelssohn's grandson described the friendship as "illuminating metaphors [for] the clarion call of the Enlightenment for religious tolerance." Lessing wrote the play Nathan the Wise, a play about religious tolerance based on his friendship with Mendelssohn. Lessing passed away on February 15th, 1781. Lessing was a member of lodge "Zu den drei Goldenen Rosen" in Hamburg. He also put forth the theory that Freemasonry sprang from a secret association of Templars in London. This theory has been completely debunked.